As we enter the cold winter months, the Chicago area has already begun to see some snow and ice. The winter weather can be unpredictable in Illinois, and before driving, it is a good idea to check the weather and plan ahead. 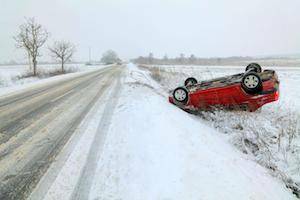 Unfortunately, even when people take extra precautions, the winter weather greatly increases the risk of car accidents, and many serious injuries and deaths occur every year in Illinois as a result. Over 1,000 car accidents involved snow. There were no deaths reported, but these accidents resulted in 160 injuries. There were 396 car accidents that involved ice. There were 66 injuries and one death as a result of these accidents. 76 reported car accidents involved sleet and hail. There were no deaths reported, and these accidents led to 16 reported injuries. 2,190 car accidents were reported as a result of wet surfaces. These accidents resulted in six deaths and 482 injuries. In unpredictable winter weather, anything can happen. Be prepared for driving in snowy and icy conditions by checking your car’s battery strength, windshield wiper fluid and antifreeze levels, tire pressure, and the amount of wear on tire treads. It is a good idea to keep at least half a tank of gas in your car to ensure that you have enough fuel to reach your destination and prevent the gas line from freezing. Start the car a few minutes before driving to ensure that the engine is warmed up and running properly. Check your exhaust pipe to make sure it is not clogged with snow or mud. Avoid using cruise control when the roads are icy. Allow more time to brake when following other cars or stopping. The holidays can be a stressful time, but even though you may be busy, slowing down and taking extra care while driving can help avoid a car accident injury or death. If you or a loved one has been injured in a car accident, Flaherty Law can provide skilled and effective legal representation and help you receive the compensation you deserve. For a free consultation, please call a Plainfield IL car accident lawyer at 815-577-7500 to discuss your case.